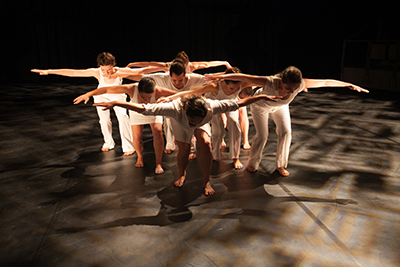 Fall Dance Concert opens December 3 | Department of Drama, U.Va. The Dance Program of the Department of Drama at the University of Virginia presents its Fall Dance Concert on December 3, 4, and 5 at 8:00 p.m. in the Culbreth Theatre. The fall concert will showcase the works of student, faculty, and guest choreographers for an evening of inventive and inspiring dance. The Dance Program is pleased to present the work of guest choreographer Katharine Birdsall. Ms. Birdsall holds a B.F.A. in dance from the Tisch School of the Arts at NYU and is one of the founding members of Charlottesville’s Zen Monkey Project. Her piece Moonlight is a suite of dances to Frederic Chopin’s Préludes No. 1 through 8 for piano, Op.28 and is supported in part by the University of Virginia Arts Council. The work incorporates musicality, dance improvisation, partnering, and choreography to create a moving response to the beauty of these piano pieces. This new piece of dance-making showcases the dancers' sensitivity to the music, themselves, and each other as expressed through their movement. Playing along a spectrum of weightlessness versus worn rigidity in both music and movement, fourth-year student Maisie Finley’s piece Proving nothing asks the question: at what point do we arrive at peace within ourselves. “I am attempting to capture how a state of peace comes with fragility, but also powerful ambition,” Finley explained. Third-year student choreographer Elyssa Fonicello states, “As a student studying both leadership and dance, I am interested in understanding methods of cultivating leadership through dance. To learn more about how leadership and dance are connected, I attended the Now Next Dance Mentorship program: a week long dance workshop that exposes young dancers to new types of movement and encourages them to become leaders.” Her piece is a visual exploration of leadership concepts and a representation of her ideas about developing leaders through dance. It also seeks to address societal attitudes toward women as leaders and the difficulties women often face when assuming leadership roles. Dance Program Lecturer Katie Schetlick's recent work considers the interplay between affect and constructed space, both imaginary and real. More than moves through questions stirred up by the recent refugee crisis and the increasing construction of physical borders around the world. What barriers do we build around our own bodies as a result? To whom do we owe what? How far out do our hands reach? In addition to showcasing strong technical, creative, and articulate dance artists, the fall concert reflects each choreographer’s creative interests – resulting in an evening of eclectic, provocative, and engaging performances. Tickets for the Fall Dance Concert can be purchased online at www.artsboxoffice.virginia.edu, by calling 434-924-3376 or in person at the U.Va. Arts Box Office, located in the lobby of the U.Va. Drama Building, open Monday through Friday from noon until 5:00 p.m. Tickets are $7 for adults, $6 for seniors, U.Va. Faculty/Staff, and U.Va. Alumni members, and $5 for students. Full-time U.Va. students may receive one free ticket if reserved at least 24 hours in advance of their desired performance date.